So as you're reading this I'm currently away with work for 5 days in London, which is an amazing opportunity but soo stressful trying to find something nice to wear for each day of the week that doesn't involve carrying 30 tonnes of luggage on a 3 and a half hour train journey. 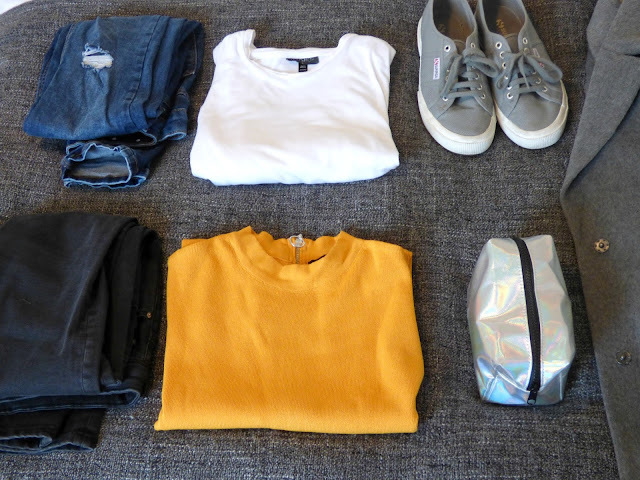 I've never been the kind of gal to get really organised with my outfits when packing, I'd just chuck in anything and hope it went together - which is usually fine when everything is black or white but I felt like mixing it up a bit this time. I limited myself to 3 simple tshirts and 2 different kind of jeans for trawlling around the city, and of course something a bit more smart for the evenings. Think a mix of high neck and plain, khaki, mustard and grey woolen tops. My new and super trustworthy grey coat from Primark which was an absolute steal at £25! 1 pair of heels and my amazingly comfy Supergas which are no joke the best shoes I have ever purchased. And finally I'm so excited to try styling my new dungarees that I picked up from ASOS as I've not worn them since I was about 5 years old! Head over to my Instagram page to see what I get up to in London and hopefully I'll have plenty of outfit posts going live when I'm there! Also if any of yall have any recommendations of where to eat then pleeeasee leave them in the comments or Tweet me because I really want to try some new places!